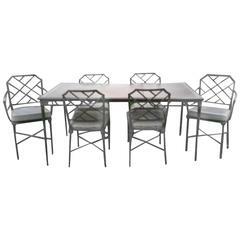 Stylish faux bamboo garden dining set with four highback chairs and rectangular table base. Can be used indoors or outdoors. Chairs have seat cushions not shown in this photo but can be seen in separate listing. We can also use COM to recover seat cushions free of charge. 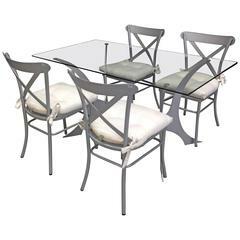 Keywords: Patio furniture, porch furniture, kitchen table, kitchen chairs, outdoor seating. Measures: Table 48" long x 30" deep x 27.5" high.